I was longing for some excitement last Sunday and wanted to explore something new. Of course the idea of doing route 76 popped up, but mob wanted me to wait until spring and do it together. I also realized that it is almost exactly eight kilometers from one gate to the other, and another five through the tunnel down to where the proper road starts, so potentially up to 13 kilometers of unpaved road, and thus up to 2.5 hours of walking, which I’d rather not do in solitude. Though solitude I got on the ride I chose instead, but at least on a very pleasant climb on the sunny side of a mountain. 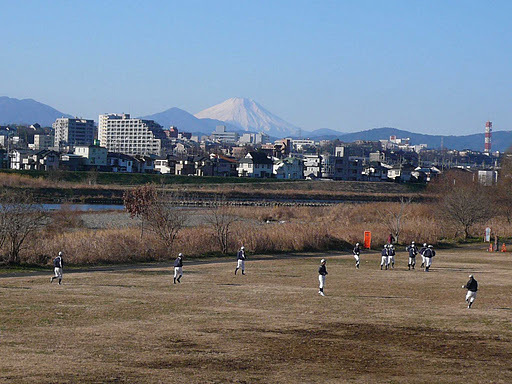 I left home at the usual time of 8am and enjoyed a particularly crisp and clear sky on the Tamagawa. This is just one example – there were at least half a dozen of them on the way. And this is not counting the increase in the number of green speed breakers. I’m all for safety on the cycling path, but how about warning pedestrians to be more careful instead of making life more dangerous for cyclists, especially when the dark breaks? Having navigated successfully through all the new obstacles, I entered the road to Itsukaichi where only red lights become obstacles in their own right. Overtook a bunch of club riders. 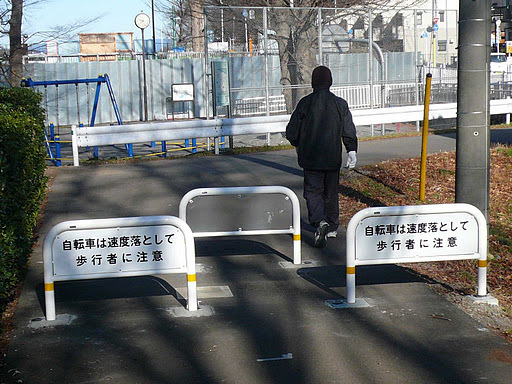 Earlier on Tamagawa, I had overtaken at least three riders on a Pinarello, a Colnago and a Campagnolo. It always makes me feel great seeing that expensive brand bikes don’t make riders faster, and that my Canyon provides much better value for money, even if it doesn’t look quite as flashy as the Italian makes. After a pit stop at a conbini in the town, I followed the Akigawa upstream, on the usual road leading towards Kazahari Toge. The air was very fresh whenever I passed through stretches that the sun had not reached yet, and there were some signs of frost, but no ice on the road. Some ten kilometers upstream from Itsukaichi, the river splits into Kita-Akigawa and Minami-Akigawa. Route 33 to Kazahari Toge follows the south river, but I turned right into route 201 following the north river. On every single map that I can get hold of, this looks like a long valley without an exit – but maybe the Ministry of Construction has in fact provided for an escape? I wanted to explore. 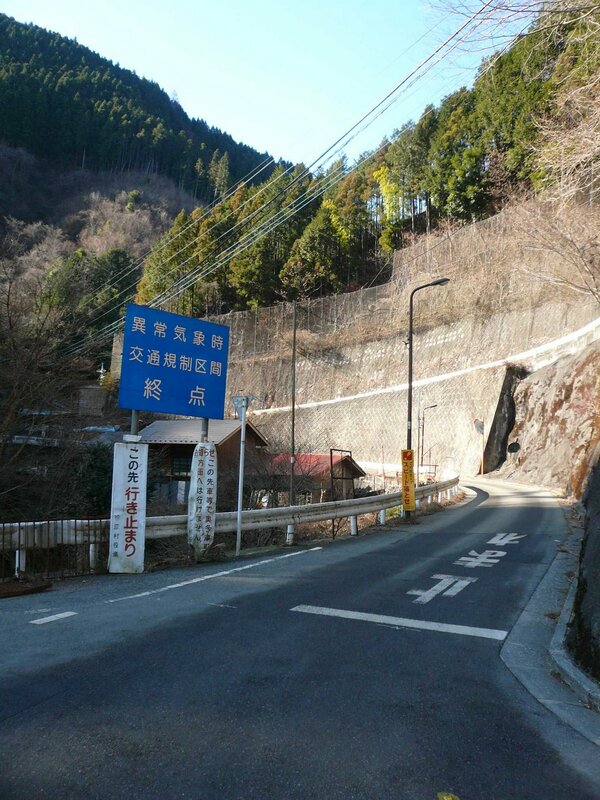 In the worst case I could always return and go up Kazahari Toge the normal road or pass over to Sagamiko. I certainly had no reason to regret entering such a picturesque valley. Nice farms here and there, the road winding along the river mostly on the north side and thus in warm sunlight which contrasted with the ice that had formed here and there in the river. Almost no traffic as soon as I had passed the first small hamlet, and still a road as broad and nicely paved as a German autobahn. But eventually everything has to come to an end. And so did the autobahn. 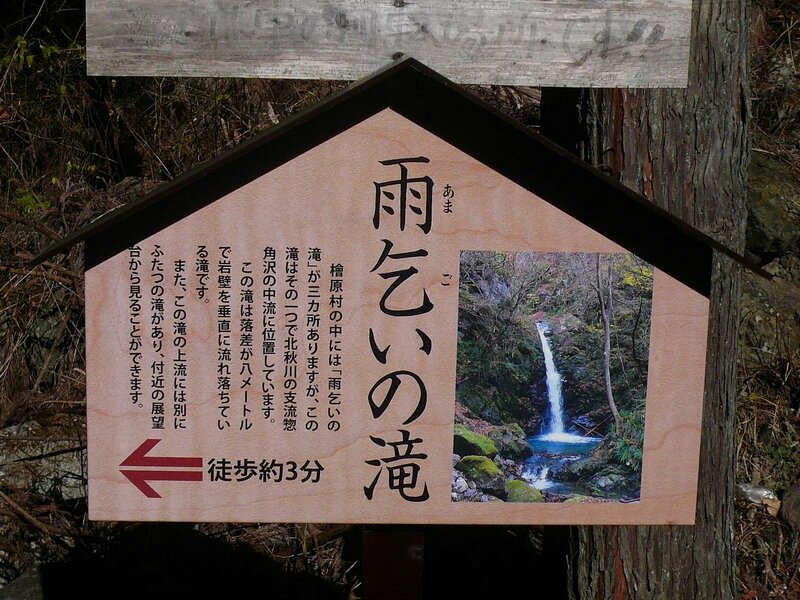 A rather detailed map alerted me to the existence of a waterfall just one hundred (altitude) meters up, so I went to see it. Getting to it involved a three-minute hike without bike through a nice forest. Returning back to the end of the autobahn, I continued straight along Kita-Akigawa until turning right onto a paved road leading up to the hamlet of Kurakake. From this point on the road became really steep, and my compact crank and 12-27 cassette served me well even when going out of the saddle. Almost continuously in warm sunshine and with increasingly good views of the lost valley below with solitary farms here and there, and a view eventually expanding all the way from the Kazahari mountains to the skyscrapers of downtown Tokyo, I reached Kakekuro, famous for its mushrooms (or so they think). It even boasts a helipad. This is where the public road really ends, and the world of forest roads starts. But what a nice forest road – despite all the warnings, it was nicely paved and nice to ride – just a little steep at an average of 14 percent. 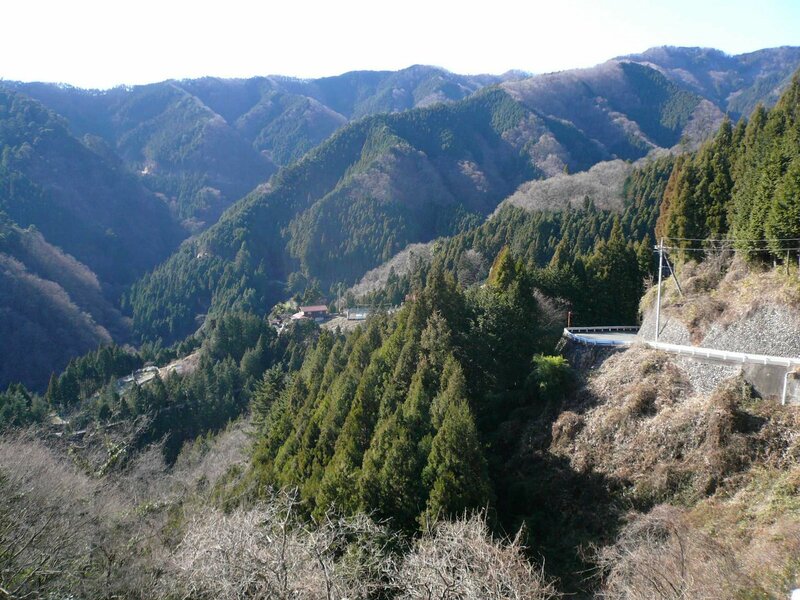 Eventually I reached the top of a long long climb, just at Kazahari Toge, where the forest road meets route 206. From there, the view of the valley and downtown Tokyo 60 kilometers afar (or so my GPS told me) were simply magnificent. As I was getting ready to descend, noisy Sunday drivers in their sports cars drove by. Shortly after I heard a police siren and was pleased in my schadenfreude. In inquired at the shop where I bought two warm mochi for lunch to learn that someone had collapsed. But why then so much presence? Well, they always go out together. There could be an oilspill or something here in the mountains, so one would need more than just an ambulance, was the answer I got. 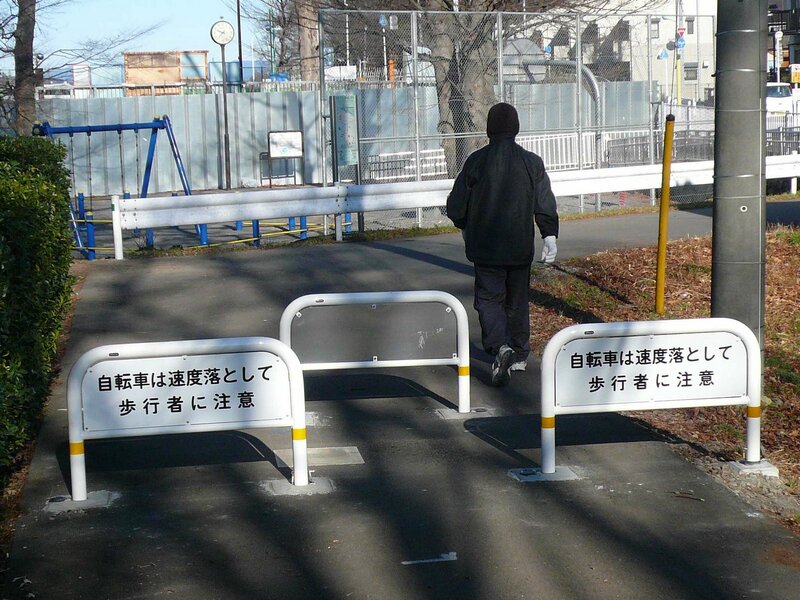 Hmm – and then they want to make us believe there aren’t enough policemen and paramedics in Japan? Now I know where to get them from! On I went all the way down from Kazahari Toge, meeting a number of riders fighting their way up. At the junction with route 33, I turned right and went for another, albeit much shorter, climb to Kobu Tunnel, beyond which I got a very nice view of the Tanzawa mountains and Fuji-san. Despite my compact crank, I had no difficulty racing down behind a motor bike to the village of Tsubaki. From there, I decided to try and work my way around the awful Uenohara, which involved several more short climbs. I was rewarded by a nice view of Mito-san, the peak towering above Kazahari Toge, but invisible from the road around the pass. Missing the last turn towards Wada which would have kept me straight on route 522 to Fujino, I ended up on route 521 and found myself at the outskirts of… well, Uenohara. So on I went on route 20 towards Sagamiko, and tired of a long day of cycling, I took Otarumi Toge with the speed necessary to get things over quickly (judging from my GPS marks, it must have been just 20 minutes – not a Bakatoge record, but not bad for the end of a cycling day). 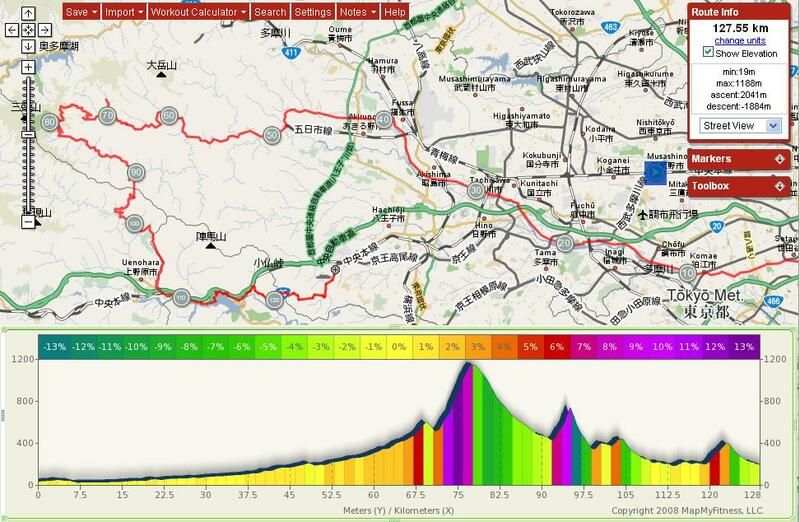 After 140 kilometers of cycling and 2,100 meters of climbing, I got onto a train home from Takaosanguchi. 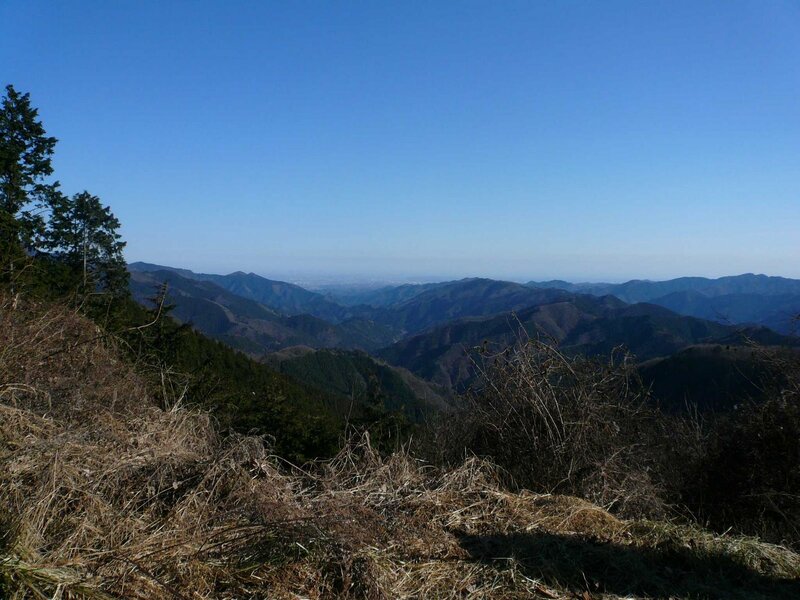 It had been a very nice tour: beautiful landscape and views, basically no traffic in a long valley and on a long climb, in nice warm sunshine (which makes going up Kita-Akigawa to Kazuhari and down route 206 a nice winter climb). Only to be recommended, even if (or because?) maps are useless. I am continually going backwards and forwards about what to do with my gearing. So I decided to post something and maybe get your opinions and in that way help myself make some decisions. I will leave the Trek alone. I intend to sell the Klein in the spring but before that I need to give myself some lower gearing on the Cervelo and might want to use parts from the Klein. My options are to swap over cranks, or change cassettes, or both. Obviously the 50-34 gives me a few more low gear options, but I am tempted to stay with the 53-39 from a ‚purist‘ perspective. Silly? I liken this to getting carving skis. I learned on normal straight alpine skis and eschewed the use of the ’new‘ carving skis for a number of years. When I finally got ‚carvers‘, they were a revelation. The carving skis are a compact crank. I really like it on the Klein. Also, given that I will swap the wheels over too (Mavic Ksyrium SL for Zipp 808), I was thinking that the Klein might be more ’saleable‘ (as a triathlon bike without the aggressive geometry) with a 53/39 on board and the Zipp wheels.